. . . the START of truly affordable housing in the heart of the rural South Downs! 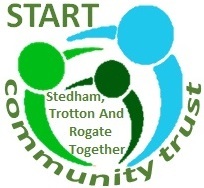 START Community Trust is a new (April 2019) community benefit society being established by the three neighbouring parishes of Rogate, Stedham-with-Iping and our own. As such, it can build low-cost housing for residents only, but it can also do anything from owning and running a post office, shop or pub, to providing car parks and playgrounds. for community members . . .
. . that's YOU . . .